In wheel mode, you can easily adjust both hue and saturation at once. The bottom slider affects the shade of gray (or black or white) at the center. Triangle mode lets you adjust brightness and saturation at once, while the bottom slider adjusts the hue. 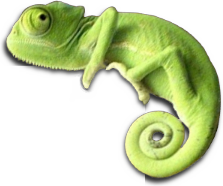 We do ask you to leave the links to Karmatics on it, and preferably leave our charming mascot, Karma the Chameleon, there for all to see and enjoy. However, we're only asking, not demanding, and we're not going to throw a fit if you don't. * We even make it easy for you to hide the poor little guy....just set the configuration variable "karma" to "bad" and he's history.